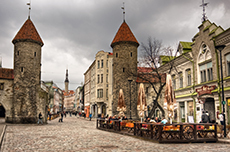 Tallinn's medieval Old Town is known around the world for its well-preserved completeness and authentic Hanseatic architecture. The tour was very good, and our guide was excellent, but the weather conditions made it difficult to navigate the old cobblestone streets. Interesting. Would have liked more history. Beautiful sights, Glad we did not return with excursion to ship and spent time walking down to the "lower" town. Our tour guide stayed too long in Upper town and talked too long about WW2. Town was very interesting and our guide was good. Loved Taillin, its history and its shops. Loved Taillin, its history and its shops. Great place for local crafts. The walking tour of upper and lower old town provided a good perspective of the history of the town and the history. Enjoyed the old town. Take good walking shoes... extreme cobblestone!! Tour and lunch included. Bus took us to the top, We walked to the castle, walked down and had lunch. Overall very enjoyable. It started very early and everything was shut. Loved the feel of the town. Loved the feel of the town. Cobblestone streets and nice shops with friendly locals. The guide and tour coverage could have been better. The guide and tour coverage could have been better. We did spend some time in an excellent market in the city square. Tallinn was a beautiful city. collected us in a minibus, took us to the old town, 2 hour walking tour and then free time, minibus back. The guide was excellent, and we loved the town. Old Town & Rocca Al Mare were cobined in one tour, and it worked very well, considering we only had half a day in Tallin. We did Old Town on our own through Hop On Hop Off Bus. We did Old Town on our own through Hop On Hop Off Bus. Great cobblestone streets but extremely crowded. We spent only half the day and returned to ship. Town was beautiful and could have visited much on our own. Town was beautiful and could have visited much on our own. Guide was less then happy about living in Estonia which made the tour a bit of a downer. This was my favorite port. We liked our tour, but it was very busy that day. We liked our tour, but it was very busy that day. We liked when we left the tour group and explored the town on our own away from the crowds. We did 2 tours with Viking. average walking tour which gave a good overview of this charming city. average walking tour which gave a good overview of this charming city. I appreciated being able to shuttle back in to Tallinn after lunch to explore on our own. Great guide and nice beer tasting. Great guide and nice beer tasting. We walked back to the ship which was quite easy. walking tour, did what it said, not outstanding but average. Very good guide. Enjoyed all the places we saw, especially the church ruins. Tallinn was great-interesting, good shops, and a feeling of being in a different culture. Tallinn was great-interesting, good shops, and a feeling of being in a different culture. Our tour guide could have been a bit more approachable, but she did an adequate job of dispensing information.